The ground-breaking musical On Your Toes (1936), one of four Rodgers and Hart musicals originally choreographed by Georges Balanchine, is widely heralded as the first Broadway musical to use classical dance to advance a plot, and where jazz was incorporated into a Broadway score. 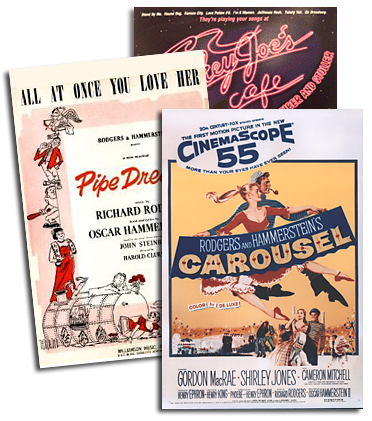 With a book by Richard Rodgers, George Abbott & Lorenz Hart, music by Richard Rodgers, and lyrics by Lorenz Hart, On Your Toes, features two ballets (“Princess Zenobia Ballet” and “Slaughter on Tenth Avenue”). The famous “Slaughter on Tenth Avenue” (the show’s Act II climax) tells the story of a striptease girl, her jealous lover/boss, and the object of the lover’s jealousy, an average Joe customer who falls in love with the striptease girl. Before the ballet culminates, not only do we become aware of the jealous bosses’ intentions to kill the striptease girl’s admirer, but we find out that the Premier Danseur dancing the roll of the Customer is also in danger, as he has also got a jealous lover (and, incidentally, a dancer rival) on his tail. The Premier Danseur is now found living his real life on the stage in front of a full house and must dance literally to save his own before the Prima Ballerina’s jealous lover carries out a lethal act of revenge on him. Robert Russell Bennett’s newly-engraved (and highly treasured) symphonic orchestration of “Slaughter on Tenth Avenue” has the ideal duration and instrumentation for your orchestra, making it easy to bring the seductive and dramatic main themes of this rousing and exciting ballet to your concert hall. Robert Russell Bennett (the multi-award-winning orchestrator) was posthumously awarded at the 2008 Tony Awards a special Tony “in recognition of his historic contribution to American musical theatre in the field of orchestrations…”). This award was presented as a result of the use of his full, original orchestrations in the current Lincoln Center Theater revival of South Pacific. For more information on this title and a quick reply, please contact concert@rnh.com or call (212) 268-9300.